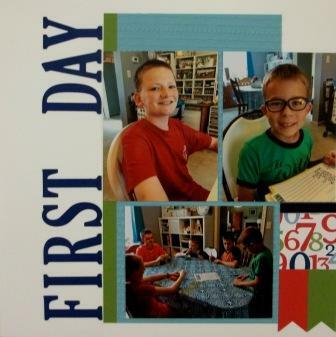 I pulled out pictures from Ethan’s first day of school for this scrapbook layout. We had some extra friends with us that day so you may not recognize all my “students” that day. The DSP used with the numbers is retired and I don’t have enough for everyone. Therefore, we will be making this layout with everything the same but the DSP. I will have variety for you to choose from to place in that spot. This colors on this layout will lend themselves to so many different layouts. Anything for children – school, artwork, parties, sports . . . would work well! Thank you for coming by to visit today! I hope your week is off to a great start! 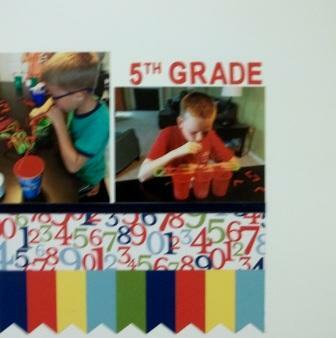 Great job scrapbooking the “First Day of 5th Grade” Becky. I love the photos and the way you highlighted the.